July 28 to August 4, 2019. This is an incredible one off experience where you can surf, hang out with and take tips from one of the greatest surfers of all time in a family friendly environment in paradise at Kandooma Surf Resort. Kick back and take surfing tips and anecdotes from video and photos of your perfect wave with Shane and a pro photographer. Legendary former ASP/WSL touring pro and a big wave legend. Coaching tips and anecdotes from Shane. Barrel riding, breathing tips and tales from the tour. Pro photographer on board to record the whole trip. Full video, photo and edit package available (extra cost). Kids club, spas and multiple resort pools. Chill out at Kandooma and take some advice, tips and anecdotes from video and photos of your perfect wave with Shane and a pro photographer. Enjoy Kandooma’s excellent dining options and refreshing beverages as you relive your day of waves with daily slideshows and video analysis and informal chatter hanging out with Shane and family. Surf daily and take in Shane’s surf knowledge garnered over 3 plus decades surfing the world’s best waves and in the world’s biggest competitions. Book on your own, bring friends or family. The food and refreshments will be plentiful as will the fun, highly rippable surf. We will have a professional photographer aboard to shoot video and stills of you, and you will watch the footage every night. A full video, photo and edit package available to all on board. Price to be negotiated with the photographer direct (guideline - $300 per person). This is an incredible one off opportunity to surf, socialize and learn from one of the greatest surfers of all time in a family friendly environment in paradise at Kandooma Surf Resort. 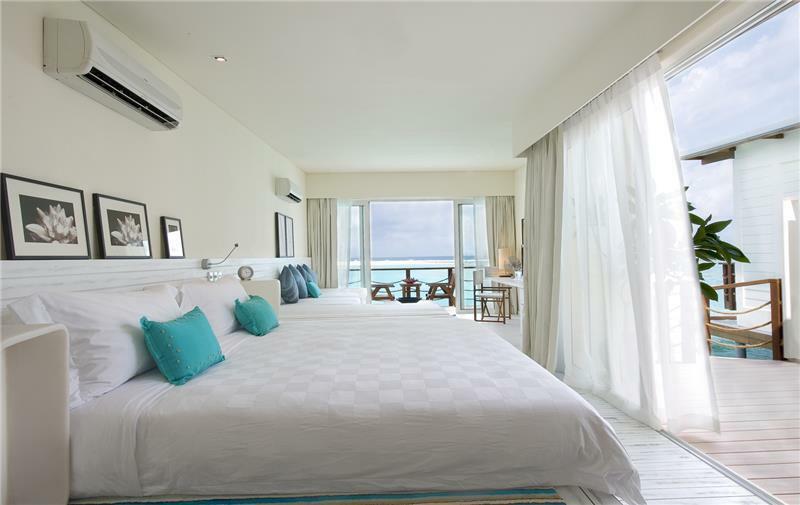 Beach View Villa - The semi-detached beach villas come with large windows that positively invite the outdoors inside. Whitewashed floor boards evoke a sense of fresh coolness, yet feel warm and textured to bare feet. They feature light summer duvets and massive bath towels, flat screen televisions, a place to plug in your mp3/iPod, indoor out-door showers and wifi broadband. The beach villas are 36 square metres in size. Beach House - The sea-facing Beach House (formally known as the Duplex Villa) offers the luxury of space. Located at the water’s edge, the villas present a striking mix of natural elements and modern design. Bedrooms are on the first floor level and enjoy views of the sea. The living area underneath the bedroom is furnished with designer seating laid out on a carpet of fine white sand. The duplex villas are 72 square metres in size, with 36 square metres on each level. Family Beach House - As the name suggests, are ideal for families or a small group, and are the size of two beach houses (former duplex villas) together. They offer sleeping space upstairs as well as living and dining below. Water Villas - Hovering above coral and marine life in the shallow clear waters, Water Villas offer the ultimate Maldives experience. Each Villa has a private sundeck with hammock that in high tide is partially submerged in crystal clear water. Expansive living space is complemented by a large open bathroom which offers a private outdoor shower and bathtub with views of the water. The Water Villas are 65sqm in size. They offer complimentary WiFi internet service to all guests and it's available in all guests rooms & reception area. A fleet of boats for transfers and recreational activities. Sun loungers for pool area and beach front. Internationally accredited PADI dive centre. The aim in the restaurants and bars of Kandooma is to offer “quality through integrity of ingredients.” Orange juice in the morning is freshly squeezed; coffee (even in the rooms) is freshly ground; tea is loose leaf; and bread and ice cream is home made. They offer choice in price as well as in menus. Breakfast (6.30am to 10.30am) - Wide archways let in the sunshine and atoll views. Fresh juice, pressed coffee, an international selection of breakfast items and attendant chefs ready to receive instructions on how you prefer your eggs. Dinner (6.00 pm to 11.00 pm) - The cafe becomes a warm cave of soft glowing light to present an intimate mood under the stars visible through the skylight 60 feet above. A banquet of travel inspired Mediterranean dishes spiced with flavours of Asia is supplemented by chefs busily working tandoori ovens, teppan grills and rottiseurs. Poolside Lunch (10.00am to 11.00pm) - Order from a menu of fresh salads, sandwiches, wood-fired pizza or pick up a choice cut of eye fillet or lamb loin you can grill yourself under the shade of the coconut grove. The Kitchen (18.30 pm to 11.30 pm) - Diners can choose to sit in elegant comfort looking out over Kandooma channel; out on the beach with your feet in the sand; or reserve a seat at the chef’s table – and engage the chefs in conversation as they prepare meals. The flavour is Thai – Mediterranean with a good representation of seafood. About 15 paces away is the wine room where a choice of 250 wines will see that some indecision will be encountered in selecting a preferred label. The Deck (5.00 pm to 10.00 pm) - A bohemian expanse of teak planking covering the rooftop of The Kitchen liberally sprinkled with low tables, startlingly blue cushions, bean bags and monolithic granite planters of greenery. It is the ideal place to worship a sunset and the Mojitos of our resident mixologist. After sundown the area is lit entirely by Moroccan lanterns and the stars. Ideal to continue with cocktails and graze on the tapas menu. Bokkuraa Coffee Club (6.30am to 11.00pm) - Boutique coffees and teas are available along with a daily supply of pastries and homemade ice creams by the coupe or cone. Take Out and Delivery (24 hours) - Whether you’re returning from a mammoth surf session or a hectic four-dive day, the only thing you might want to do is flop on the lounger and get a pizza in the comfort of your Kandooma home. Muster up enough energy to drag out the compendium and look up what is available. You have a choice of ordering from a list of simple but utterly tempting bites. You will have a choice of picking it up at the agreed time or having it delivered for a one off price. Plates and cutlery are all in your room. They use reusable containers whenever possible but where disposable is unavoidable they use biodegradable food containers. Three different menu styles serve three different times from breakfast, all day and night owl. Kandooma Kids Club is for ages 4 - 12, and the coordinators develop numerous different activities to amuse the kids while you surf or relax. Children will learn, create, engage, and learn about the fish, flora & fauna around the island, mix cakes, fancy dress......there is no end to the adventures! It is open from 9am to 8pm and you can sign in kids aged 4+ for free, for as long as you want. If they are under 4 years old, then you have to pay a babysitting charge of about US$15 per hour. They have indoor and outdoor toys for the kids; painting, craft and kids movies etc and the staff are fantastic and will do face painting or play with them in the sand. They also have a water playground outside, as well as an air-conditioned room upstairs with game consoles for the older kids. If you want babysitters at night, then they will come to your villa and it’s about US$15 per hour. Maximum number of Surfers at Kandooma is 50 and surfing Kandooma right and taking the surf transfers are only for Perfect Wave Guests. No exceptions. To surf at Kandooma you MUST book a complete surf and accommodation package through The Perfect Wave or one of its many worldwide agents. If you don’t have a surfer package from The Perfect Wave, you will not be able to surf at Kandooma or take any surf transfers from the Island. What does this mean to surfers at Kandooma? Guaranteed Limited Surfer Numbers at the Resort! With limited numbers at the resort we can now guarantee that all surfers on Kandooma Island will be able to enjoy one of the best right hander’s in The Maldives uncrowded every day. We believe that there is no closer accommodation to take off zone in the world. You barely have to walk 30 meters from your villa to the paddle out point, and you literally lie in bed and watch the hollow and highly rippable waves peel down the point. The Perfect Wave have been running the surf program at Kandooma Resort now for 6 years and we have an experienced resident surf guides and a surf instructor on the island from 1st April - 31st October to look after all surfer guests on the Island. However we have an instructor / guide on hand 12 months of the year for learn to surf and guiding in the off season. The Perfect Wave team at the resort will look after all your surfing and yoga needs. We have a western head guide managing our local Maldivian surf guide team. All guides are first-aid trained and water-safety qualified. The breaks around Kandooma Resort have something for everyone, from first time beginners on the beach break; to those beginners that want to move to an intermediate level; to experienced surfers looking for fast barrels and rippable walls. The surf instructor is qualified to teach and help progress to non-surfers and surfers of all levels. Full-day surf transfers are a 3-hour trip up to four times daily to any South Male Atolls breaks, with departure times variable depending on the best surfing conditions. Surf breaks visited are Riptides, Foxys, Twin Peaks, Quarters, Tucky Joe's, Last Stop and Kate’s. Natives/Foxys - This wave is very fast and hollow breaking over relatively shallow coral.On transfer you will visit both Foxys (L) and Rip Tides (R), so you get the best of both worlds. Riptides - A right hander breaking for 150 meters on a reef in the middle of a channel. Need a transfer to this wave even though it is very close. The wave is aptly named as sometimes very strong currents can sweep you seaward so we always check current conditions before settling in for a session. Great wave for the longboarders and shortboarders as well as low intermediate surfers. Twin Peaks - Sectiony left & right, which picks up more swell than most of the breaks in South Malé Atoll. Can have a good end section on the left in a big southerly swell. Quarters - The wave has two sections, the outside is a fat, slow and meandering wave perfect for long-boarders and even beginners and the inside section is a really nice, fast little right-hander that picks up less swell than most other places but on its day delivers perfect barrels. Kates - Small short left, best in winds NW to N. This wave is a fickle one, but with the right conditions is a very fun option. Tucky Joe's (L) - The take off can be steep and a very fast reaction is required to set up for the freight train ahead. Up to 200 m long it offers many barrel opportunities, sometimes linking to offer long intense rides out of the sun. The Perfect Wave Surf Experience Centre opened on the island in 2013. The centre now stocks anything and everything you need on your surf holiday. You can hire surf boards or purchase new surf hardware, board shorts, reef boots and surf hats, so you are covered if you forget anything. We have a variety of boards for hire, including long boards, small wave fish, and softboards for learn to surf lessons. North Male Day Trips (additional cost) - If the swell is pumping up in North Male, it isn’t hard to get a group together that want to go. The guys bring their partners along and it is a full day out chasing waves, lots of fun. The surf guide will let you know when it is best to go and will organize the day trip with lunch included and beers on the way home. These trips are subject to weather conditions and minimum numbers are required to run the trip. The surf guide will advise when and if the trip is possible. The Perfect Wave now offers a very safe and fun Kids Surf Camp for beginners, with a certificate awarded at the end of the camp. The lessons are done at the sand bank, and all equipment is provided. 3 days x 90 minutes, with the commencement day decided at time of booking. Please note that children must be able to swim. Lessons must be pre-booked at The Perfect Wave Office. Price: US$195 per child (Minimum 3 children). The time for a well balanced combination of yoga practice and vacation is here. Join us for an unforgettable experience to practice yoga on Kandooma resort, one of the world's most breathtaking locations. This vinyasa-style yoga class will weave together the physical, emotional and spiritual aspects of your vacation to transcend you into complete wellness and relaxation! Single class: US$15 | Pack of 5 classes: US$65 | Pack of 10 classes: US$120. Private lessons: US$65 per lesson. Repair and/or replace costs apply if damaged. 1. Introduction to surfing in lagoon (30 min) - Free of charge. Including board hire. Shared lesson. Now you have a taste on the flat water and want to get that slice of magic and stand on your first wave. We make sure you get the opportunity, in a safe and supervised environment. Including board hire. Shared lesson. For the experienced surfer who needs some one on one expert tutorial from our experienced surf instructor. You might find the smallest tip makes the biggest difference. Includes analysis and debrief. Daily snorkeling trips & lessons. The Dive Centre is comprehensively equipped to meet the needs of advanced divers but also suitable and thoughtfully set up for absolute beginners. ‘Dive Now Referral Form’ with PADI - which allows you to begin your dive adventure back home and complete the course with us. Bubblemaker - for children 8-10 years to experience scuba diving in pool-like conditions. Discover Scuba Diving - the first encounter with the wonders of marine life! PADI Scuba Diver - with 3 training dives in the lagoon, 2 boat dives to maximum 12 meters & 3 theory modules with advancement for a full certification. Open Water Dive - 5 training in the lagoon, 4 boat dives and 5 theory modules. Advanced Open Water Dive - an ideal hands-on experience in different areas of diving such as Night, Deep Drift, Fish ID, Wreck, Navigation and many more. Specialty Courses - Enriched air Nitrox, Digital UW Photography, UW Naturalist, Rescue Diver, Emergency First Response. The idyllic setting at the COMO Shambhala Spa at Kandooma sets the scene of serenity and calm and is the perfect getaway from all the pressures and demands of today's modern world. The spa experience at Kandooma is all about energizing in a natural environment with its wide range of therapeutic massages and spa treatments in five treatment rooms with breathtaking oceanic views. COMO Shambhala Spa at Kandooma now offers a Surfer's Massage (45 mins) and a Spa Yoga Package. Yoga is complimentary when a massage is purchased through Spa. Maximum number of surfers at Kandooma is 50. Surfing Kandooma Right and taking the surf transfers requires the compulsory surf program package. No exceptions. To surf at Kandooma, you must book a complete surf and accommodation package through The Perfect Wave. If you don’t have a surfer package from The Perfect Wave, you will not be able to surf at Kandooma or take any surf transfers from the island. Prices above are subject to foreign exchange fluctuations until paid in full. *The current advertised early bird discount of 30% is valid for all 5 night low season packages including any room type and return airport transfers, based on twin share only. Any other package configuration still qualifies for an up to 30% discount. These are combinable with the other promos we have available, so please contact us to enquire about further discounts and specials. ** Package prices do not include lunch, dinner or beverage plans, but these can be added.